This post marks the first of many by our newest Point, Robyn Braverman. Robyn–a longtime humanitarian globetrotter–has found herself back in Iowa City, helping to run her brother’s organic farm. Welcome, Robyn! We look forward to your food chronicles! Rituals and tradition should never be something one is obligated to do–rather it should be something we relish and actually look forward to doing. Abject poverty and forced isolation forced my great-grandparents to eke out something edible from every part of a food item. Chicken, a scarcity, was one such item. My grandparents remembered their parents cutting up a whole chicken, using the gizzards as a bit of a delicacy, the carcass for soup, the meat for various other meals, and the skin and fat for something that my family has fond memories of: grieven, the Jewish version of chicharron, and schmaltz, that golden, rendered chicken fat. What would a family gathering be without something sweet, chewy and mysterious that brings us back to the smells and sounds of kitchens forever etched in memories? Who knew that the mere sound of making grieven could harken us back to such precise and detailed memories of Bubbi Foreman’s kitchen? Oy. My mother remembers my grandfather never eating butter because he was accustomed to the flavor of schmaltz on rye bread. Grieven. Upon hearing the word, I am transported back into my great-grandmother’s and grandmother’s kitchen. This really is the Jewish version of bacon. Making it is fairly easy, unless, of course you are making it for 40 of your closest family members. Finding chicken skin is next to impossible. A trip to our local Mennonite chicken producer allowed us to buy six fat chickens at a time. Interviews with many a Jewish mother led me to the best grieven recipe. De-skin the chickens and chop it up. 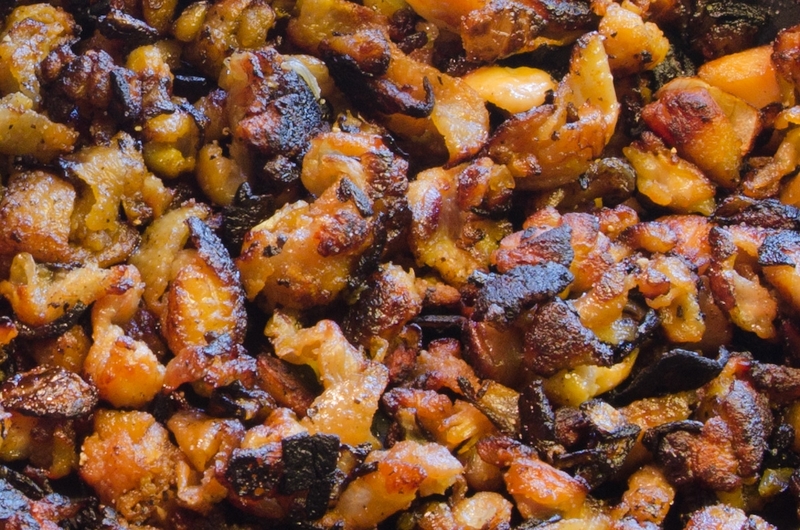 According to some Jewish mothers, cooking the chicken skin is about all you have to do, but the majority of those polled suggested adding chopped onion to the pan, once the chicken skin has taken on a grayish color. At that point, heating up the burner will give the onions and the skin time to get crispy. Once that is done, drain the schmaltz and serve. Now, after some additional research, I discovered that grieven can actually replace bacon on a BLT, or it can be used as an alternative to bacon bits on a salad. The thing is, grieven never lasts long enough to try. Served at a recent buffet, in fact, it lasted less than 15 minutes. We may be on to a new trend here, for all those bacon lovers looking for something new. All these years in NYC, and I’ve never heard of grieven. How can it be? Oy!